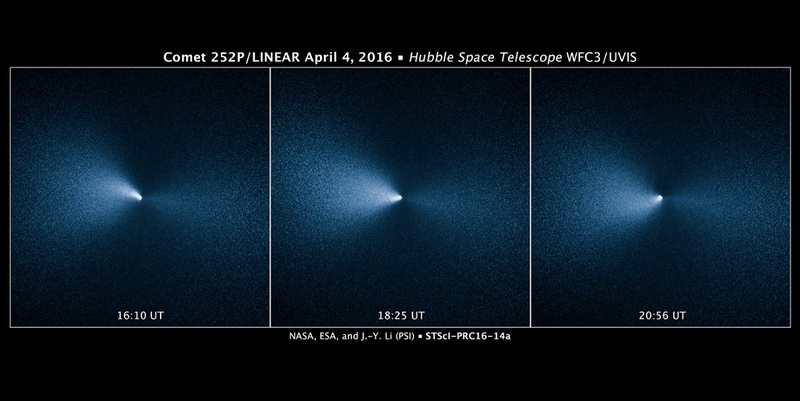 This sequence of images taken by NASA’s Hubble Space Telescope shows Comet 252P/LINEAR as it passed by Earth. The visit was one of the closest encounters between a comet and our planet. The images were taken on April 4, 2016, roughly two weeks after the icy visitor made its closest approach to Earth on March 21. The comet traveled within 3.3 million miles of Earth, or about 14 times the distance between our planet and the moon. These observations also represent the closest celestial object Hubble has observed, other than the moon. The images reveal a narrow, well-defined jet of dust ejected by the comet’s icy, fragile nucleus. The nucleus is too small for Hubble to resolve. Astronomers estimate that it is less than one mile across. A comet produces jets of material as it travels close to the sun in its orbit. Sunlight warms ices in a comet’s nucleus, resulting in large amounts of dust and gas being ejected, sometimes in the form of jets. The jet in the Hubble images is illuminated by sunlight. The jet also appears to change direction in the images, which is evidence that the comet’s nucleus is spinning. The spinning nucleus makes the jet appear to rotate like the water jet from a rotating lawn sprinkler. The images underscore the dynamics and volatility of a comet’s fragile nucleus. Comet 252P/LINEAR is traveling away from Earth and the sun; its orbit will bring it back to the inner solar system in 2021, but not anywhere close to the Earth. These visible-light images were taken with Hubble’s Wide Field Camera 3. The Hubble Space Telescope is a project of international cooperation between NASA and the European Space Agency. NASA's Goddard Space Flight Center in Greenbelt, Maryland, manages the telescope. The Space Telescope Science Institute (STScI) in Baltimore, Maryland, conducts Hubble science operations. STScI is operated for NASA by the Association of Universities for Research in Astronomy in Washington, D.C.